This beautiful Perky-Pet® Daisy Vase Vintage Hummingbird Feeder is elegant and highly functional. 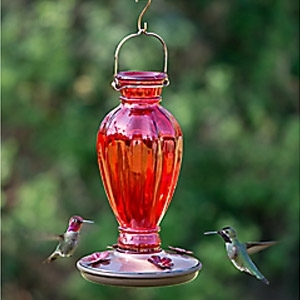 Just fill with 18 oz of nectar and hummingbirds will buzz to your porch, backyard or garden. The gorgeous daisy vase glass design with red luster finish will certainly complement your outdoor décor. Its features include a wide mouth opening for easy filling and cleaning, four flower-shaped feeding ports for optimal nectar access and a 18 oz nectar capacity to keep your hummingbirds visiting day after day.